The Walking Dead returned last night with the explosive Season 8 premiere. Now, AMC has released a special 360-degree video featuring an extended scene from last night's episode, which sheds some new light on both Negan (Jeffrey Dean Morgan) and Father Gabriel Stokes (Seth Gilliam) and a pivotal moment from last night's debut. Fans can get a 360-degree look at the action in this extended VR scene, but if you haven't watched last night's premiere yet, be warned because there will be SPOILERS below. This extended scene comes towards the end of the episode, when Negan tries to find somewhere safe in his compound The Sanctuary, which has now been overrun by zombies, thanks to Rick Grimes (Andrew Lincoln) and his crew. With seemingly nowhere to go, he takes sanctuary inside a trailer. The scene then cuts to Father Gabriel, left on his own after the selfish actions of The Hilltop Colony leader Gregory (Xander Berkeley) abandoned him. During the episode, we saw how he ended up in the same trailer with Negan delivering his now-infamous "s----ing pants" line, but this video shows how Negan ended up there as well, while also allowing fans a 360-degree view of the entire scene to see even more of the action unfold. This scene is part of a new initiative known as AMC VR. AMC recently announced that it has launched a new, immersive virtual reality app, AMC VR, which allows users to step into the worlds of AMC's groundbreaking original series like The Walking Dead, Into the Badlands and more. The AMC VR app, which is available now for iOS, Android, Gear VR and Google Daydream, allows users to experience virtual scenarios such as becoming a walker from The Walking Dead or getting Hong Kong-style martial arts training from the "Into the Badlands" Fight Camp. Users will also be able to watch the latest AMC trailers and behind-the-scenes video in the AMC VR app's screening room. 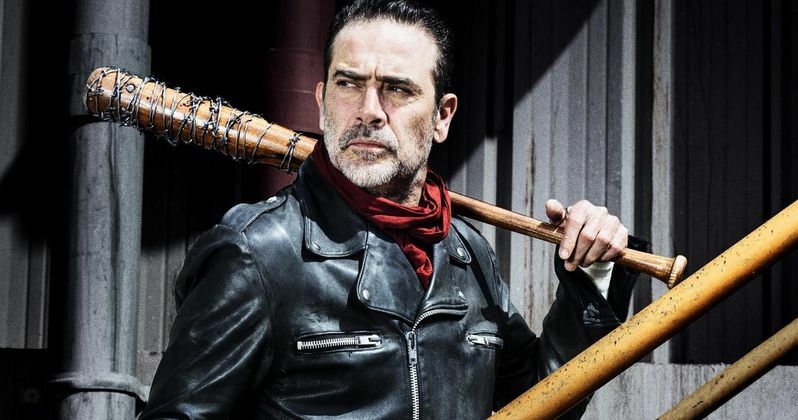 Additionally, timed to The Walking Dead's 100th episode, AMC VR debuts this extended 360-degree bonus scene from the Season 8 premiere starring Jeffrey Dean Morgan and Seth Gilliam. Directed by series executive producer and special effects makeup supervisor Greg Nicotero, co-directed by Kevin Cornish and produced by Moth + Flame, the extended scene will be available on the AMC VR app following the conclusion of the Season 8 premiere airing Sunday, October 22nd at 9pm ET on AMC. Here's what Mac McKean, EVP of Innovation and Product Development for AMC and SundanceTV, had to say in a statement. "With the launch of AMC VR, we are pleased to bring shows like The Walking Dead and Into the Badlands to life in an immersive and experiential way. Viewers want to enter the worlds they watch on AMC, and this app brings them there." The AMC VR app also has other content including a four-part experience entitled Attacked, directed by Greg Nicotero. The first part is entitled Trapped, where you're trapped in a abandoned car and must see if you can survive until help arrives. The second part is Surrounded, where "the walkers are closing in, and time is running out." The third part, "Devoured" teases that, "Unfortunately, not everyone makes it out alive in this world," while the fourth and final part Herd reveals that you're now part of the walking dead, and you get to "join the herd." There are also two VR experiences from Into the Badlands, with a Virtual Reality Fight Camp which features stars Daniel Wu, Aramis Knight and Ally Ioannides watching themselves practice a choreographed fight. There is also "Tilda on the Wire," where Daniel Wu (Sunny) teaches Ally Ioannides (Tilda) how to use a dead body to her advantage for a Season 2 scene of Into the Badlands. Take a look at this new 360-degree video from The Walking Dead Season 8 premiere below, courtesy of AMC YouTube.